Posted on October 26, 2017 by D.J. …and I’ll be there at Artist Alley table L32 as part of The Comic Bug Pavilion! Joining me at my table will be cartoonist Douglas Gauthier (pronounced “heysoupface“). He’ll have his zines, and I’ll have THE AMELIA COLE OMNIBUS, NEVER ENDING, THE BIGGER / BIGGEST BANG(s) for selling and signing– and a special free comic with each purchase! Ancient Greek and Roman mythologies have inspired many story narratives throughout history. The sword and sorcery genre was explored in the early years of cinema, but became globally popular in the 1950s-60s. Starting with Hercules: The Legendary Journeys and Xena: Warrior Princess in the 1990s, such tales have experienced a resurgence in film, television, and comics. In this hour, the panelists will historicalize the genre and explore the stories that are currently entertaining audiences. 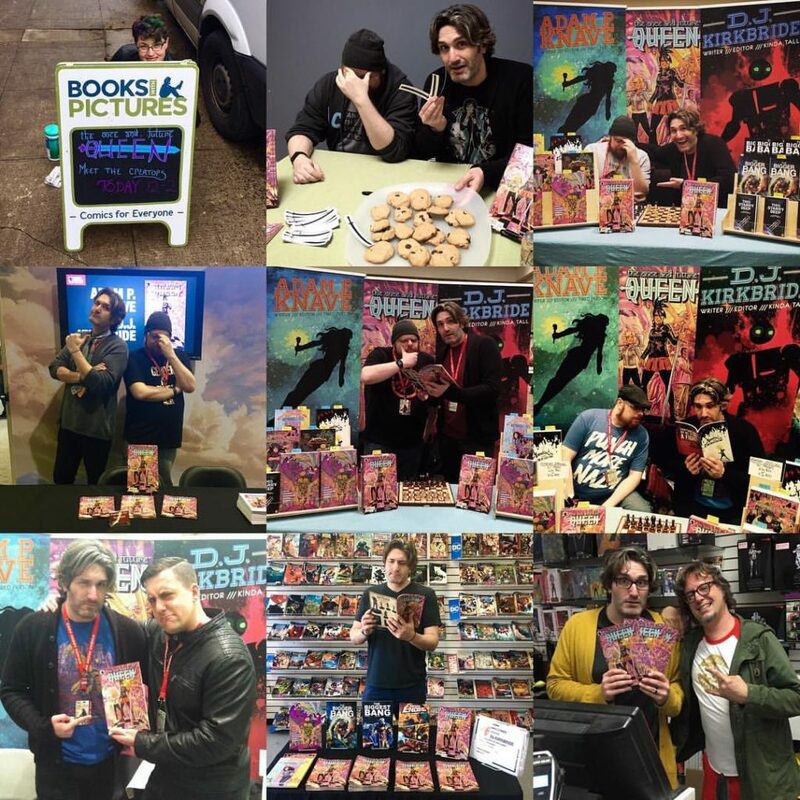 Are you an independent comic book creator frustrated that your local comic shop doesn’t seem interested in carrying your comic book or supporting your career? Are you a comic shop owner feeling pressure from local creators to carry their self-published dreams when you have so many other bigger issues to worry about? Believe it or not, these two elements offer up a tremendous opportunity for SYNERGY! This can be a win win for BOTH of you and our panel of both comic shop owners AND creators will tell you how they’ve navigated themselves into a relationship of mutually assured SUCCESS! BRAVE NEW WORLD (Newhall, CA) owner Andy Liegl, HI DE HO COMICS owner Eddie DeAngelini, ASPEN COMICS Editor-In-Chief Vince Hernandez, Editor/Writer Barbara Kesel and Writer D.J. 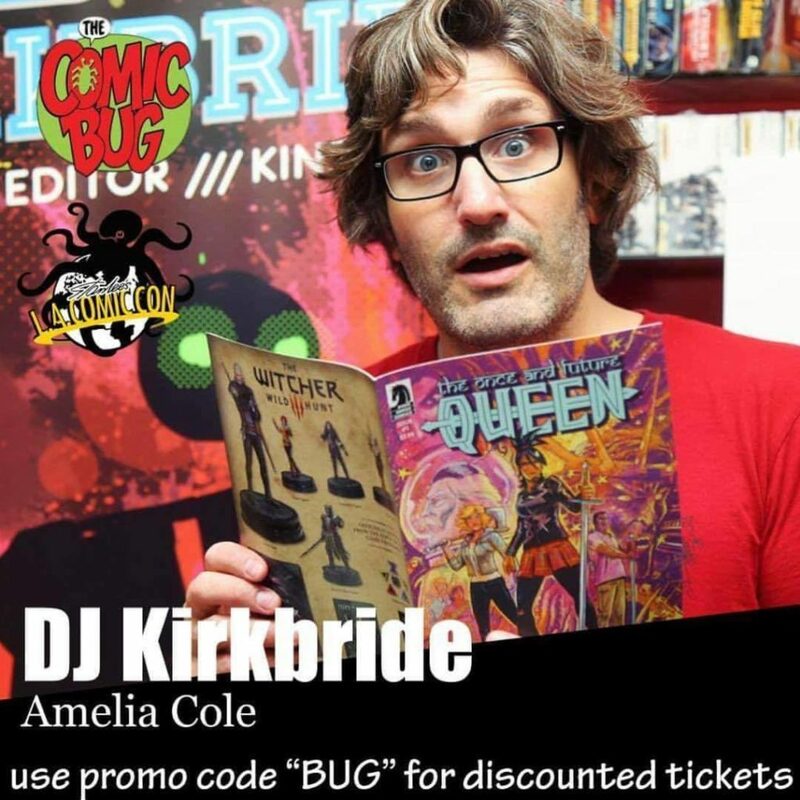 Kirkbride will be joined by THE COMIC BUG’s Mike Wellman in an insightful, progressive and problem-solving conversation on how YOU can get your books on the shelves of some of your favorite comic shops and how to help make your store enthusiastic to support! If you’re a local creator in the LA area, this is not a panel to miss! Posted on April 26, 2017 by D.J. Hey! I heard you have some really important news about The Once and Future Queen? We do. We do. What has happened? 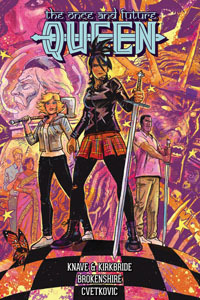 Issues #3–#5 of The Once and Future Queen have been cancelled, in print and digital. But there will still be a trade collection of the full series released in November. You can order it by clicking here, right now, in fact. Why did this happen? The comic industry is a fickle thing. The Once and Future Queen was well received by press and its readers, and while it was growing in market awareness, print efforts have been shifted to the book market so we can grow and reach our target audience. So you guys failed then? The hell you say! We crafted a story that we are deeply proud of, that everyone involved is deeply proud of, and that will see the light of day come November. Anything else we should know? Eat your veggies. No, seriously. This happened fast, and we’re letting you know as soon as we could. Thank you to everyone who picked up issues #1 and #2 and enjoyed them. We won’t let you down. This story has been an amazingly good time to create, and we want you to have the same good time reading it. Also, you know, some of the stuff you’ll see in the trade… the Gwen/Rani/Lance stuff people think they know where that’s going and y’all are wrong so far, which is delightful. Bigger plot things going on that… It’s exciting, it’s fun, and we stand behind it every step of the way. So yeah, thank you guys! 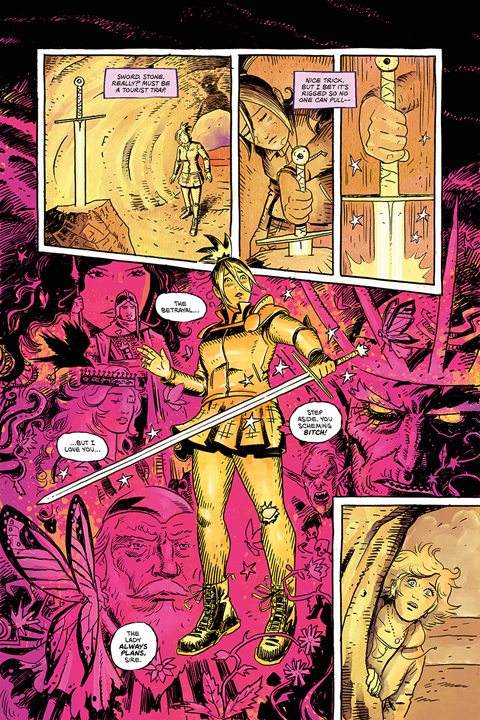 And don’t forget to order The Once and Future Queen trade paperback at Darkhorse.com, Amazon.com, or Barnes and Noble! THE ONCE AND FUTURE QUEEN #1 release week! Posted on March 9, 2017 by D.J. 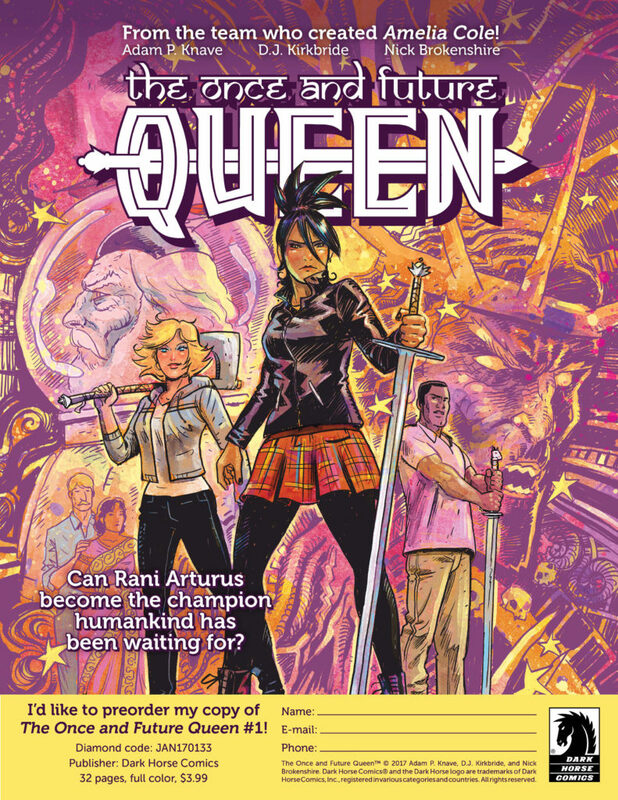 I want to thank everyone who made the release week of THE ONCE AND FUTURE QUEEN #1so great! From stopping by Things From Another World Milwaukie the night before to the Books with Pictures release day signing to Emerald City Comicon and the Dark Horse Comics booth signing to yesterday’s The Comic Bug signings, amazing comic signing signing signing times were had! Also, want to read some interviews with the creative team? Here are some handy links!